Taste of Ottawa’s Easter edition will be held this weekend at 430 Churchill Avenue. Nicola Maule is a local writer who is always looking for new events that bring excitement to Ottawa. A couple of years ago I decided I was going to start trying to live my life a little more green. This included riding my bike to work more than once a month (in the summer), improving my compost recycling habits and eating locally-produced food more often. Well, guess which one I excelled at? Hands down: Eating local! Eating locally produced food is getting so much easier in Ottawa with all the new local artisan food producers making delicious everyday items like honey, chocolate, baked goods, coffee, salsas, and chutneys — to name a few. Farmers’ markets have popped up all over the city, however, in the cooler weather it is sometimes harder to find the local products we love. Well this weekend is an exception! To help you shop for all the Easter essentials, stop by the first annual Taste of Ottawa- Westboro Easter Food Market on Saturday March 23rd at 430 Churchill Ave. at Byron between 10 a.m. and 3:30 p.m. This Easter market will feature 18 of Ottawa’s local artisan food vendors selling hot cross buns, gluten free treats, gourmet teas, organic pork from Pork of Yore, ganache-filled chocolate eggs from Koko Chocolates and dark and milk chocolate bunnies from the Hearty Bakery. 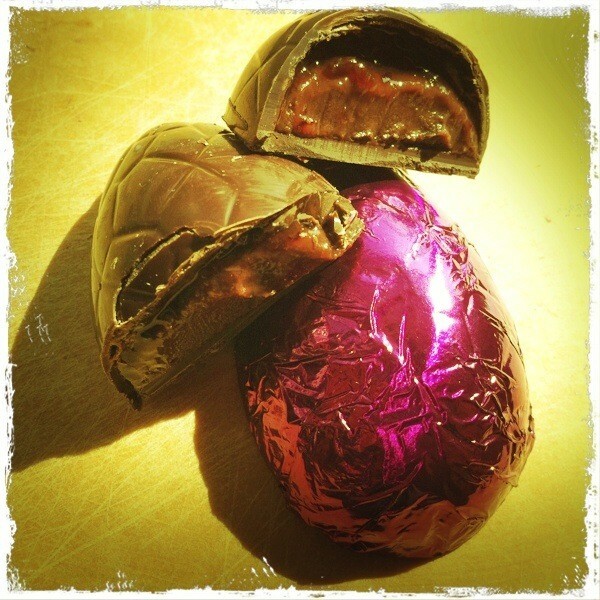 Koko Chocolates: ganache filled eggs with flavours of spring mint, lemon lavender, plum star anise and caramel. A special appearance will also be made by Major Craig’s Black Garlic. Be among the first to try it in Ottawa! Black garlic is made from fermenting and aging regular garlic for around 45 days. The process started in Korea, and has now become a popular method of achieving a unique flavour. Black garlic is said to have a sweet and rich molasses- like flavour with balsamic, caramel, fennel, and licorice undertones. The Snell House Creamy Garlic salad dressing is the product that turned my kids into salad eaters and they can’t get enough of it. Also, be sure to come hungry and stop by the Relish The Flavour food truck which will be serving a delicious fresh lunch on-site. Come and see why food trucks are no longer just for poutine and hot dog lovers! Also, you can try out some of the newest gadgets from Kitchenalia. Entrance to the Westboro Easter Food Market is free and there is plenty of free parking. Donations will be collected for the Westboro Region Food Bank. For more information you can visit www.osfa.ca or follow on twitter @Taste_of_Ottawa. The sponsors for the event are Diane and Jen – brokers from Royal LePage, Givopoly- online concierge gift service, Kitchenalia- Westboro kitchen store and Sheri Creese – broker from Mortgage Brokers Ottawa.